We’re a team of sparkle horses lashed to capitalism. I am both embarrassed and proud to report that I recently concluded reading Robert Jordan’s The Wheel of Time (1990-2013). I have been reading this series of novels for the past twenty years. And I have not been alone in this activity. Spanning fourteen volumes and nearly twelve-thousand pages, Jordan’s text is quite the literary achievement in terms of longevity, scope, and length. The Wheel of Time of time is, quite simply, one of the longest fantasy epics ever written. And I imagine that it will continue to capture the popular imagination in a number of ways going forward. If George R. R. Martin’s projected seven volumes of A Song of Fire and Ice (1991- ) can be made into a wildly successful television show on Home Box Office, the sky’s the limit for The Wheel of Time. It does not seem too early to think about it as a text that should be taken seriously by literary scholars interested in emerging long forms, dispersed (or distributed) narratives, and the contemporary hyper-commodification of narrative. The Wheel of Time raises questions about literary “authorship” and the novel-as-mega-text, and it resides between the two extreme poles of the mega-text: works by a single author on one end of the spectrum; and on the other, emergent texts like massively multiplayer online games and works of the multitude. 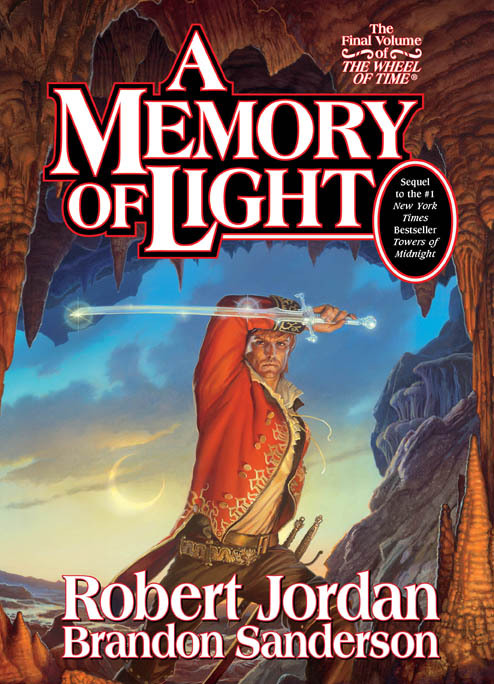 Jordan’s tragic death in 2007, and the subsequent completion of the series by Brandon Sanderson, invokes not only questions about the death of the author, but the work of the multitude, as The Wheel of Time positions itself between these poles in a number of interesting ways, and will continue to do so for the foreseeable future. Sanderson’s final three novels, The Gathering Storm (2009), Towers of Midnight (2010), and A Memory of Light (2013), though satisfyingly faithful to Jordan, and perhaps refreshingly concise, resemble Jordan almost too well. One always got the sense with Jordan that his imagination had been run through some fantasy-narrative generating algorithm that just produced endless serialization, and Sanderson is nothing if not evidence that this type of narrative production (in the full sense of the term) can be outsourced. At the end of the day, The Wheel of Time is best understood as a narrative machine whose clear goal is to produce a considerable amount of money by selling thick volume after thick volume once every couple years for twenty-three years. When D.H. Lawrence once called Walt Whitman a machine, he had no idea. The Wheel of Time is an immense narrative machine. And its terms are drawn firmly by the conditions of late capitalism. And I mean that in a number of ways. First and foremost, though surely not on par with Tim LaHaye and Jerry B. Jenkins’s Left Behind (1995-2007) and Harry Potter (1997-2007) in terms of commercial success and in the number of volumes sold, which wildly outrank Jordan in those categories, The Wheel of Time has still consistently debuted at number one on The New York Times best seller list, has sold over forty-five million copies, and is obviously one of the richest intellectual properties (IPs) available in terms of its potential for further commercialization and capitalization. Even Sanderson’s ending which, I suppose, is one I won’t spoil, leaves the door open to further narrative. I will be surprised if there is not considerably more Wheel of Time ahead that will appear across a range of different media. In short, it will become a text written by an unnameable many. Sanderson is probably only the first in a long line of Jordan surrogates. But I wish this wasn’t the case. I hope they let it stand as a book / text that can only be read (despite all the text’s obvious and insidious problems, of which there are many). I know there is no way this will happen. We inhabit the small period of time when we can say that The Wheel of Time is principally a series of books rather than a dispersed set of (not always fully related) texts on diverse media platforms. There is yet no television show, no movie, no MMORPG. So for the moment it is an excellent example of a “single” author mega-text. (Sanderson is so faithful to Jordan that one might suggest he does Jordan better than Jordan, and more concisely.) And since it is such a large, exhaustive, encyclopedic text whose principal attraction is precisely its massive proliferation and accumulation, it is a good site to begin sketching some thoughts about how single author mega-texts function. In a previous post on Mass Effect 3 I defined the mega-text as something that required incredibly non-trivial effort and time to experience or complete. 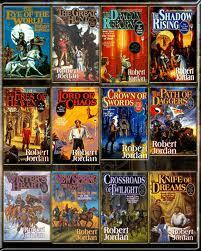 I have been reading Jordan’s novels since the end of fifth grade. I consider this to be a non-trivial amount of time. I continued reading because I had become wholly absorbed in the series’ telos; like many, I had to know how it ended. I reached a moment when I had been reading The Wheel of Time for so long that I couldn’t not keep reading. This wasn’t a kind longue durée page-turner. It was like a job. (Once one gets in the habit of repeating a task, it becomes second nature.) Regardless of how much my literary taste may have matured or changed, once every couple years I found myself wrapped around a new Wheel of Time book for a day or two, tearing through its 900+ pages. Reading it became ritualistic, familiar, a way of marking the passage of the years. A way of reflecting. But I also constantly had to ask myself why I continued reading this interminable, never-ending tale that only seemed to accumulate narrative threads rather than resolve those threads. It was maddening. By the time I received another volume I would have forgotten much of the narrative arc. So rather than be engrossed, I would often be confused, forgetful, dislodged. It became a way of remembering and pointing to a larger (often personal) and multiplicitous past, briefly and captivatingly glimpsed in the threads of narrative repetition and familiarity. Most recently, The Wheel of Time is yet more proof that I am indeed getting old. Time passes. The body wastes away. And I imagine I am not alone with such feelings. Twenty-three years is a long time to wait to learn how a story ends. The mega-text, quite simply, requires and produces different temporalities of reading. Another reason The Wheel of Time is such an effective narrative machine resides in its affect. Its plot is compelling. That is its whole raison d’être. The series accumulates narrative threads from the perspective of messiahs, apostles, prophets, wizards (Aes Sedai), etc., etc., quite readily. With its hundreds of (often compelling) POV characters, it positions the reader as “agent” of the novel’s world’s history, a multiplicitous omni-subject urged to connect itself affectively to the dramatic sweep of the narrative network, to inhabit multiplicitous “subject” positions within the history of the series’ world. And the networked scope of the work is very much part of what produces The Wheel of Time’s particular brand of literary pleasure. Jordan’s epic offers up a vast history that is often developed in excruciating and exacting detail. This often means that the emotional texture of Jordan’s prose is formulaic, with consistently flummoxed wooly-headed men being stared down by some bemused woman with her arms crossed beneath her breasts. Each novel’s structure is fairly similar and repetitive, with some kind of “boss fight” at the end of nearly every volume. And of course there are the necessary “twists” and peripeteia that upset the direction(s) of the narrative arc(s). More than anything, the series’ narrative is achingly, mind-numbingly teleological. At a certain point, the pleasure of Sanderson’s ending was that nothing was surprising, that it was predictable. Sanderson fulfilled his contract with Tom Doherty Associates as well as with the reader. Consequently, a reading of The Wheel of Time as a fervently conservative, end-of-history-era document engaged in nostalgically imagining a strange Medieval version of a neo-liberal economic paradise, clearly suggests itself given the text’s sense of a monolithic, eschatological history. The (evangelical) Christian overtones of the reborn messiah figure lording over multiple nations in order to hasten and prevent the destruction of the world, thereby fulfilling “history,” is blatantly in line with Reagan-era neoconservatism, 1990s-2000s American neo-evangelism, and the national fantasy attending the closing days of the Cold War (there is a thoroughly “evil empire” who of course will get defeated.) If there is any gesture toward other traditions, say, Eastern spirituality—i.e., the yin-yang duality of the male and female halves of the “one power” (which I think can / should be read as the mechanical / electronic harnessing of the universe’s forces along the lines of Henry Adams’s dynamo or the atomic bomb)—this spirituality is thoroughly orientalist, a result of mining other cultural traditions for their exoticism. The hegemony of European modes of living and their contrast to the more “exotic” cultures in Jordan’s world also reinforce the novels’ Eurocentrism, fully locating the West as the principal site of (its) history. Further, many aspects of the books appear to be as almost perfect allegories for the displacement of 1990s conservative ideology onto this space of fantasy. The entire series is pushed by the inhuman weaving of “the pattern” (the force of the “free market”) toward the destruction (production) of the Dark One (profit). Rand al’Thor, the novel’s antichrist / messiah, known as the Dragon Reborn,, rather than having as his principal activity the epic “task” of adventuring, largely spends his time dealing with bureaucracy and procedure, organizing men, putting them to work. By the final book, A Memory of Light, he is more like some kind of abstract idea or concept than he is anything resembling a rounded “character.” He is a messiah-as-American-CEO. Surrounded by advisors telling him otherwise, he still boldly sets forth on a path of radical individualism. And like any good technocrat, he grew up in humble surroundings, never asking for the mantle of leadership or responsibility to be placed upon him, while refusing to bend under the weight of his monolithic(ally normative[ly boring]) responsibility. He is the hybrid character that would be produced if the fantastic worlds of Ayn Rand and J.R.R. Tolkien crossbred. One of the clearest things about how one should approach The Wheel of Time is that the series is everywhere marked by a will to project a world, to create or textually become a world. And this is one of the principal locations where its conservative project can be seen. The world of The Wheel of Time is its primary “character,” its primary concern, rather than the humans inhabiting that world. In fact, Jordan’s perspective on human interaction and social realities is fairly adolescent. This is probably unsurprising given that one can probably assume that TOR Books is aware that a significant portion of its readership are (or at least once were, like myself many years ago) male adolescents. So, rather than the creation of a world in order to more fully imagine the limits and possibilities of the human, this mega-text formally requires the reification of its human subjects, limiting their range of emotion and expression to the capacities of a geeky adolescent. That the series continually emphasizes the network of connections between the denizens of its world only reinforces the sense that reading The Wheel of Time can be like scrolling through your thirteen year-old nephew’s Facebook feed. Everything the characters think or say, regardless of its significance, is exhaustively and repetitively provided. Through the reification of the human in Jordan’s space, communication in this brand of the mega-text becomes principally mere information, hyperarchivally accumulating in order to absorb (and commercially collect) the reader(’s parent’s hard-earned cash). Perhaps more than anything, however, The Wheel of Time might now be considered a touchstone for the mega-textual novel. Obviously this claim can be argued with, and I hope it is, but in sheer scope and size, it will stand monumentally over the fantasy genre for a number of years. Though I don’t imagine it will ever replace Tolkien as fantasy’s primary referent, Jordan is surely trying to outdo The Lord of the Rings (1937-1949) in a number of ways, and the comparisons between the two will continually be drawn. George Martin will rival Jordan, but he would have to write for another decade (or more, probably) to equal The Wheel of Time’s scope. For the moment, The Wheel of Time is the mega-textual novel par excellence of contemporaneity. And I hope these brief notes begin to point toward some of the ways of engaging with the text that might prove critically productive. The Wheel of Time has so clearly captured a certain segment of the American imaginary precisely because of its size (and little else), and it is so clearly an outgrowth of our current moment’s hunger for accumulating text, information, and data, that to ignore its logic would be a major oversight for thinking about how literature works in the twenty-first century. It’s fifteen volumes if you count New Spring (2013). This is also to note that hopefully I will be posting more original material / critical writing to this blog now that I have finished the first draft of the dissertation. So stay tuned. There are a number of critical projects I have in the works that this seems the best venue for, including some thoughts on Fallout: New Vegas (2010). Jordan did leave behind considerable notes, and Sanderson claims that Jordan composed a manuscript of the last chapter, so the words are all his at the series’ end. Even if the fact that the series finally ended is the occasion for writing this post . . . one could easily imagine that, after the monumental adaptation of The Wheel of Time that goes from 2017-2032 (much like is happening with Star Wars [1977-?] right now), in 2042 they’ll make the first MMOARG, or whatever, as The Wheel of Time 2. Nerds of the future beware. I’m predicting the hyperinternetwhatevermachine is going to explode with impotent nerd rage about “authenticity” or whatever. Jordan’s IP has already tentatively started to cross-pollinate with other media. There was a Wheel of Time computer game published in 1999. Wizards of the Coast released The Wheel of Time Role Playing Game in 2001. During the heyday of Magic: The Gathering and collectible card games, there was a short-lived Wheel of Time: Collectible Card Game (2000). There has been a comic book series, published by Dynamite Entertainment, The Wheel of Time: The Eye of the World (2005- ). And there are reports of a video game in development by Red Eagle Games. Most significantly, however, it has been reported that Jordan’s estate has optioned the rights to the Universal Entertainment Corporation. (The National Broadcasting Company has no idea what kind of goldmine it’s sitting on here.) Unlike Martin, Jordan is pretty PG-13, and thus perfect for primetime network drama. The scope of the narrative would probably permit a relatively small budget, at least at first (The Eye of the World  occurs primarily in the countryside, and the first book’s ability to be filmed on a modest budget I have to imagine was on Jordan’s mind. Jordan might not be much to speak of as a prose stylist, but he repeatedly proved himself a shrewd businessman). I also imagine that there is a significant potential for a Wheel of Time massively multiplayer online game. I distinctly remember conversations in a warehouse one summer with another Jordan aficionado about how it would never end. I hope he enjoyed the series’ conclusion(s). This is also way of thanking all those I read and talked about The Wheel of Time with during middle school (the early 1990s). One might suggest that were Jordan’s prose any more rich or engaging (i.e., at all), this would distract from the absorptive quality of the narrative. In this way it readily suggests a video game adaptation. Even from the opening pages of the text can I imagine that this “spoiler” surprises anyone. I.e., the appearance of the Sharans in the last book, one of the few people / places in the series that was frequently referred to but never represented, is a particularly acute instance of Jordan’s orientalism. They appear seemingly randomly, without the (endlessly articulated) motivations of other events. They have nothing resembling the history of the nations the main characters inhabit. And their ahistorical existence means that they can readily be killed by the forces of “light” without worrying about their essential humanity (as opposed to killing the inhuman Trollocs or Myrddraal, inhuman monsters who have nothing resembling subjectivity). This is also probably the place to note that The Wheel of Time of course has an extensive wiki. Don’t worry I have neither the time nor the space nor the inclination to start talking about the plot, which is probably revealing in that the details of the events in the book, at the end of the day, are both superfluous and encyclopedic, normative and exhaustive, interesting and super boring. It also may necessitate a new way of talking about “reading,” because “close reading” (or “distant reading”) do not really work here. Perhaps a term like “patient reading” is in order—i.e., to critically approach The Wheel of Time simply requires the patience to read twelve-thousand pages (no matter how “entertaining” they might be). I should also note that Jordan is highly conservative in terms of gender and sexuality (though Sanderson addresses this a bit in the final books, which is appreciated), and is at times a bit misogynist. (I.e., Rand has three wives and continually misunderstands them. Then they’re frustrated by his inability to understand, which frustrates him, ad nauseum. There are very few relationships in the book that resemble real adult relationships. Who knows how Bleeding Edge (2013?) might (or might not) complicate this.